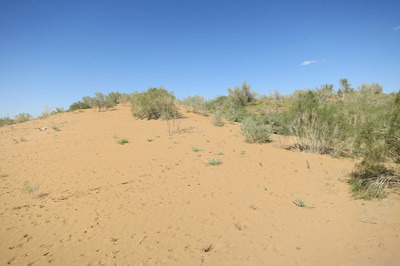 Sandy is in the Kyzyl Kum desert of Central Asia, between the rivers Amu Darya and Syr Darya in Uzbekistan, Kazakhstan and parts of Turkmenistan. The name "Kum" in Turkic can be translated as "Red Sands". Reddish coloration are here sands formed by weathering and deflation indigenous sandy sediments. The surface of the desert has a gentle slope with a general south-east to north-west, to the coast of the Aral Sea. It is a plain with a general slope to the north-west (the height of 300 meters in the south-east and 53 meters to the north-west) has a number of closed basins strongly dissected and isolated remnant of the mountains - Bukantau (764 m), Kuldzhuktau (up to 785 m), Tamdytau (922 m) and the other composed of silnodislotsirovannymi and metamorphosed Paleozoic schists, hornfels, limestone, granite. The mountains are deserted, mostly with aligned peaks, rocky, heavily dissected slopes. Occupy a large part of the desert tracts of sand formed semifixed sands. The most common sand ridges meridional orientation. The relative height of the ridges - from 3 to 30 m, maximum - up to 75 m plains are composed of Cenozoic shales and sandstones in the north and north-west - loamy sandy loam river sediments Zhandarev, Kuandari and other ancient beds of the ancient bed of the Syr Darya and Amu Darya - Akchadarya flowing into the south-east corner of the Aral Sea in the north-west of the many takyrs. 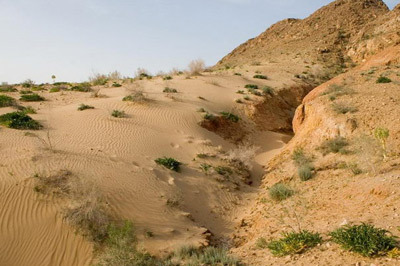 A characteristic feature of the Kyzyl Kum desert - the existence in the central and south-western parts of the isolated low mountains - remnant ridges. This Bukantau, Dzhetymtau, Tamdytau, Kuldzhuktau the west - Sultanuizdag. All of them are remnants of the Paleozoic (Hercynian) folded chains, located on the northern extension of the structures chains Pamir-Alai (Turkestan range and Nuratau) and raised recent tectonic movements. Ridges are composed of strongly dislocated and metamorphosed Paleozoic schists, limestones, granites. On the tops of the ridges and outcrops of many developed surface alignment used for rain-fed crops. 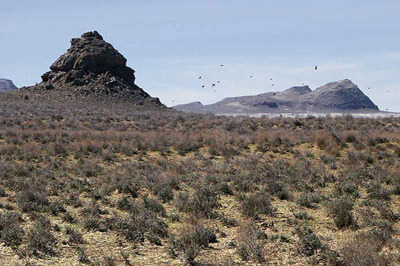 The slopes of buttes strongly dissected, there are trails at the foot of rubble and sand accumulations are often repositories of fresh groundwater, which sometimes feed the springs that supply water mining towns. In the area of ​​outcrops are flat rolling hills and plateaus cuesta type, made slabonarushennymi Cretaceous and Paleogene sediments (marl, sand, clay). Also characterized by the presence in the central and south-western parts of the vast desert of closed basins (depressions and Karakata Ayakagytma). 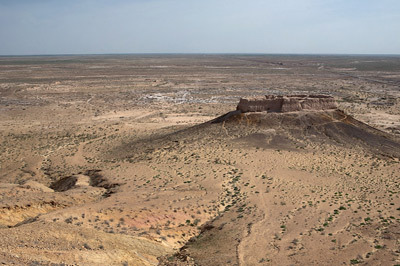 Ayakagytma (Agytminskaya Basin) - Basin in the southern part of the Kyzyl Kum desert to the south-east ridge Kuldzhuktau in Uzbekistan. Its length - 35 km, width - 15 km, the area - 600 square kilometers The minimum altitude is 133 m bottom Sides smooth steep. The bottom is a desert landscape with a vast saline. In the middle of the basin irrigation lake is the size of 15x10 km. Residents in Ayakagytme engaged in farming, animal husbandry and fishery. Title depression Kazakh means "no attack", as most of the valley is impassable because of sticky mud and puddles many kilometers. 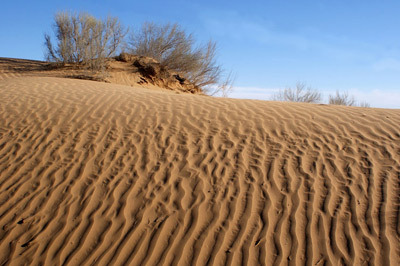 Most of the Kyzyl Kum desert occupy tracts of sand formed semifixed sands. The most common sand ridges meridional orientation. In towns and around the wells are free-flowing, sand dunes. A substantial body of sand dunes stretched along the Amu Darya. In most cases, exposure of sand - is the result of uncontrolled grazing and trampling of vegetation by livestock watering, and use of shrubs and haloxylon on fuel. In some parts of the works are to strengthen the sand by planting shrubs buckwheat, cherkez and others. Sand dunes in the south of the desert, looming in the oases of Bukhara and Karakul and covered them, now fixed. It created a powerful barrier of greenery (cherkez of trees and large black haloxylon) up to 120 km. 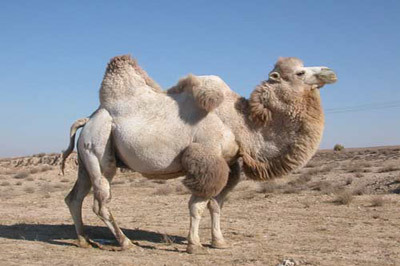 In Kyzyl Kum desert made grazing of sheep and cattle (mainly karakul sheep) as well as camels, horses, fewer cattle. The management of the pastures and the creation of new wells allowed to dramatically increase the number of livestock. In the central and south-western parts of the desert have been found large artesian basins. Near the artesian wells in the valleys deep pockets of agriculture, cultivated melons, created experimental station of which are aimed at providing additional livestock feed. Conducted into the desert channel of the reservoir on the Syr Darya Chardarinsky allowed to master the part of desert land for rice fields, orchards and vineyards. In the mountains of the desert remnant has a variety of mineral resources (marble, graphite, turquoise, asbestos, coal), work the mines. Not so long ago it was discovered Muruntau gold deposit, which already has increased settlement Zarafshan (in Uzbek - "Gold"). In the south, is the largest gas field Gazly. Gas was also found in the south-western edge of the desert on the right bank of the Amu Darya River, near the station Farab. Jeep safari through the Kyzyl Kum desert gives travelers the opportunity to visit the most remote places in Uzbekistan. During this tour, you can actually see the dying Aral Sea, the famous "graveyard of ships" in Muinak, Ustyurt, and of course the Queen of Central Asia - the Kyzyl Kum desert, with its vast expanses and the ancient caravan routes, dunes, takyrs, salt lakes and antiquities age in the millions. Moreover, tourists can learn a lot about the culture, way of life, crafts, traditions and customs of the local population. The most appropriate time for this type of travel is the middle of March - beginning of June, the end of August - October. Safari "ships of the desert" by means of the pursuer, who leads the camel. Independently can ride only those people who already have the skill to ride this two-hump "means of transportation". During this journey you can visit the yurt camps, swim in the famous lake in Uzbekistan Aidarkul visit the eastern city of gems and reach the shore of the Aral Sea. Yurt camp at Lake Aydarkul is the starting point for a fascinating expedition to the region. From here starts camel rides and tracks. So, while traveling on the lake tourists can watch the flora and fauna of the red desert, while hunting and fishing fans will be able to enjoy over lunch of freshly caught fish.